Pure arcade, challenging, falling blobs, puzzle game. 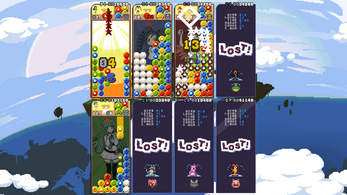 1-8 players local co-op (2 on keyboard and/or 8 gamepads). 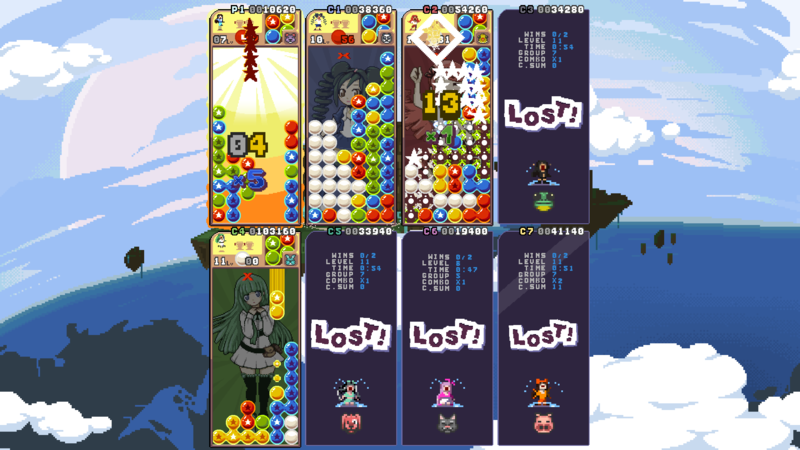 Up to 16 players with CPUs! Battle and non battle Arcade mode. CPU players with 6 difficulty levels. 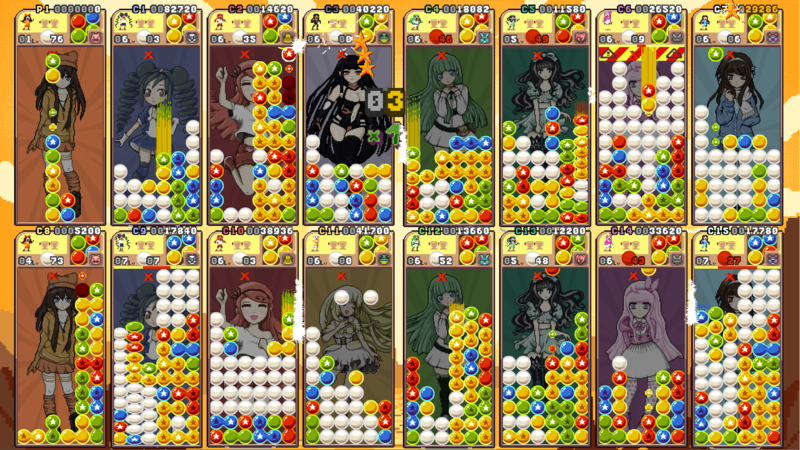 8 + 1 hidden playable girls each with 3 different versions. Available on Windows, MacOS, Linux and Android. 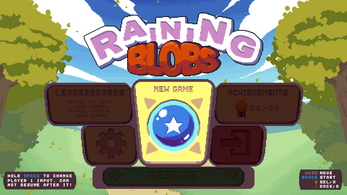 Raining Blobs heading to Xbox One! Raining Blobs also available on Android! Main game mechanic is to group the blobs by color and clear them by adding 2 or more same color stars. The bigger the group the higher the score and more garbage sent to the opponents. Setting up combos will multiply the current score and send extra garbage to the opponent/s. 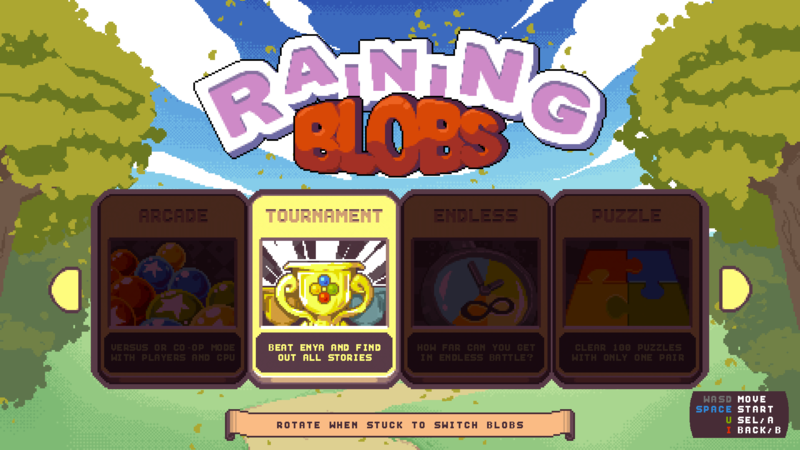 All those crazy Japanese puzzle games like Puyo Puyo, Super Puzzle Fighter and the rest are inspiration for Raining Blobs. I don't use Steam where can I download the last full version??? have you maybe bought the game in the past here? Right now you can only buy it on Steam and on Android and soon it will be available on Xbox One. Demo versions are also available on both platforms. Yes I have bought the game here (01.01.2016), but now it's not displaying in my account. On what OS are you playing it? I think I accidentally removed it while removing some unused files here. You should have it available tomorrow. I just checked and the Windows version was not deleted, you should have it. Please check and let me know. I will update all versions very soon. The page says that there is a demo available but I do not see a download button. Is the demo steam only as well? Currently the demo is available only here, take a better look at the bottom ;) There are Win, Mac and Linux demo versions available for download. I realized why I couldn't see it. On the itch client, the webpage is formatted differently so you can't see the buttons. When I checked on Google Chrome it's there. Any news on the Itch version returning? Hello! I will release fully playable demo version these days! Buy option might be enabled in the near future, for now you should buy it on Steam. Buy option was removed on publisher's request. I already bought it back when it was still being sold here since I didn't want to use Steam. That's why I asked. Ah, OK. If you have already bought it I can probably update it and you still be able to download it. What OS do you use? And thanks for doing this. Hopefully the publisher reconsiders in the future, what with the new Itch client being a thing. Is there a plan to make the game available again on itch.io ? Yes, I hope it becomes available very soon. Working on huge updates that add more content and polish. 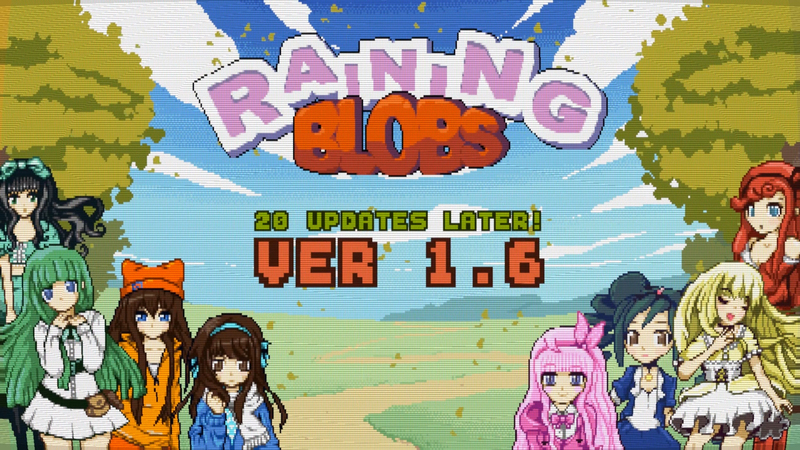 They are working fine in any other game or emulator but impossible to configure in raining blobs, even just connecting one works in the main menu but not in the configuration section. I am sorry to hear that they are not working! Can you first explain how you are trying to use it? To make sure everything is OK for testing, connect the controller before starting the game (it should work if you connect it while in game but just in case) and on first screen where it asks you to press start, press X button on the gamepad (that is start by default) or button A and let me know if you can navigate the menu with it after that. The input on which you press start or A on first screen is the main menu controller. The pad is connected before I launch the game, when the game starts I can press the A button on my pad (Number 1 in controller settings), then UP and DOWN are working fine, I can navigate to controller settings, the Start button on the pad is not recognized by the game but A-B-X-Y-L-R-Select are working and can be assigned to a game key. After the key selection I can start the game but LEFT and RIGHT are not working, UP-DOWN-A-B-Start are working. When I connect two pads or more nothing works even in game menu. What OS version are you playing? That should be a problem in the MonoGame framework I am using, it should be improved very soon and the problem should be gone. I recently got couple cheap Buffalo SNES USB gamepads and they are working great. I am glad that you like it! RainingBlobs.sh is obsolete, maybe I forgot to delete it :) You should just run "RainingBlobs" file. I see, thanks :) Can you delete it in the next release so that I can run the game via the app? I will delete it tonight! If you delete it, is it starting through the app? Yes :) Thanks btw for the fast response. By the way, it works great in the itch.io app! Hey Amos! thanks for the tip, I added OpenAL32.dll in the game and it works. I have changed the windows version, you can try it. While it worked for me like that there was a player that said the music is not working for him on Win 10 64 bit. After he installed OpenAl it worked fine. So I put the installation back. After he installed OpenAL.. and removed OpenAL.dll from the game folder? The game will pick up the .dll in the game's folder first, and the OpenAL installation second. So if there was OpenAL.dll in the game's folder it would've picked it up first. Are you sure the player was not using an old version of the game without OpenAL soft? He just confirmed, there was OpenAl dll in the root folder and there was no music. It worked for me but not for him. I am on Win 8 and he was on 10. Not sure what the problem could be. Hey Amos, just to make this clear. After a while I also got the issue with no sound playing but everyone else was OK with it. I realized that I was supplying bad OpenAL dll version with the game. The one I had was around 100KB and the proper one that I recently replaced is around 800KB. I didn't know there are multiple versions of it, now there are no sound issues. Alright, thanks for the explanation & glad you got it working for everyone! 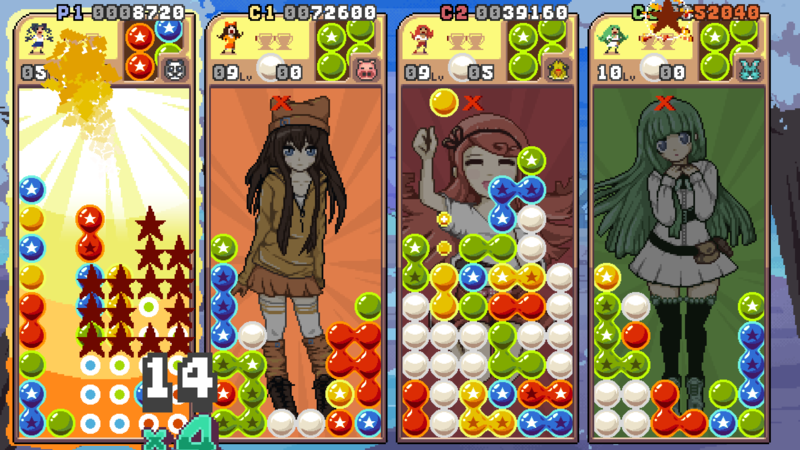 I feel that you should mention that this was inspired by the Puyo Puyo series if you're gonna charge so much for this, considering they have the exact same gameplay and layout. Coming to Steam this month! Mac version haven't been updated in a while, enjoy!